Grain ingredients are received into storage bins from rail cars and from trucks. Based on your specific formulations, ingredients are then blended into a mash and required premixes and vitamins are added, specific to your farm’s needs. 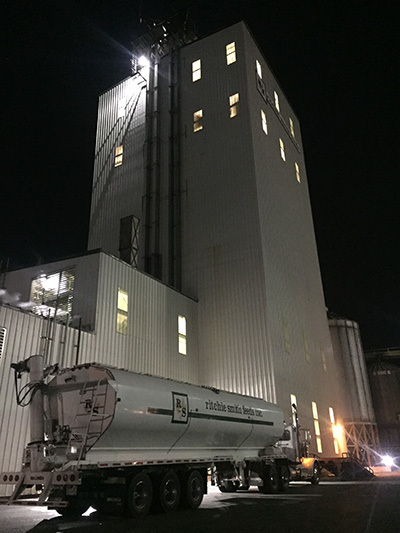 Some mash feeds (primarily ground ingredients) are final product, while other mash feeds have further value added through the pelleting process. Generally, pellets are a final product, but in many cases, they have further value added through a crumbling process before completion, to accommodate younger and smaller birds. Mash feeds, pelleted feeds, and crumbled feed products are then transferred to load-out bins. 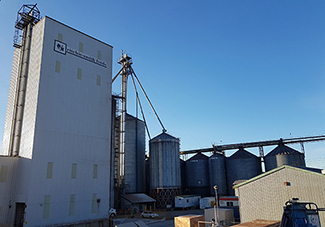 Feeds are either loaded onto feed trucks and delivered to customer farms, or the product is bagged or toted and delivered by our crop/bag truck. 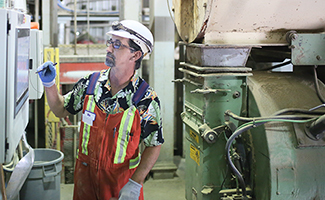 Ritchie Smith was the first feed company in the Fraser Valley with two mills on one site, thus enabling the isolation of ruminant and non-ruminant bulk feeds. Mill A (our older mill) focuses on the production of feed for dairy, hog, layer and other miscellaneous species. This mill contains no prohibited material (MBM). Over the past 50 years, many improvements have been made in Mill A. The mill has grown in size and production capacity, equipment has been added and systems have been upgraded. In particular, the two pelleting lines are state of the art, with liquid coating systems that precisely add liquid ingredients and allow the finished product to be uniformly blended with fats and oils. Our corn & barley flaking systems are also exceptional; two separate machines with one dedicated to flaking barley and the other exclusively to flaking corn. improved weight and feed conversion due to improved digestibility of feed ingredients. Mill A & B Load-out – Automated process makes loading efficient and reduces error. Truck Disinfection - Upon entry and departure from every farm, each truck's tires are sprayed by a disinfectant spray system and the driver steps in a foot bath to minimize the bio-security risk. Crop/Bag truck - Delivers feed and additives to customers who require bagged or toted product or specialty products. Prosoft Software - We have integrated our accounting, ordering, production and delivery systems, increasing efficiency and reducing the chance of error. The Texture Dairy Line (LO3 System) is one of the premier systems in Canada. This process batches small lots of textured feed from numerous ingredients, screens the product of fines and then applies liquid molasses and vegetable oil just prior to loading onto a truck or tote bag. Traceability: Real-time, accurate records are provided that enable quick feed recalls if necessary. Accuracy and Precision: The integration of Engie software with precise scales ensures mixing accuracy. Formula Families: Automatic sequencing and flushing decreases the probability of contamination. This sequencing is possible because of a unique association between formula families. 'Keep Full' System: Increases efficiency by automatically managing bin inventories and keeping them full. Efficiency: The automated processes can load trucks – on its own - in half the time as compared to the old technology! Reliability: Operational break-downs can happen, as with any equipment, however the location of the problem can quickly be determined through the intel of the system and rectified by our experienced Maintenance and Operations Teams. A second pelleting line is currently being added to Mill B and will be operational by the fall of 2018. 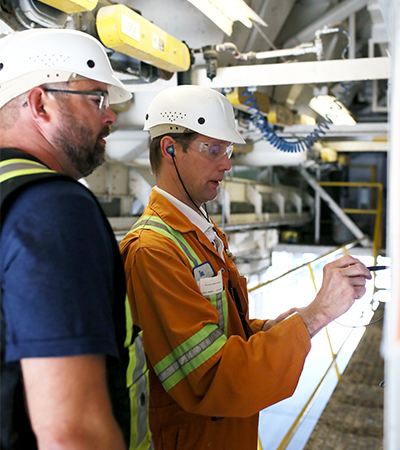 This new processing line will be one of the largest and most automated of its kind in the Canadian feed industry. This pelleting line will also have an Expander. The capacity of this line has the ability to pellet feed at more than 60 tonnes per hour! A second load out bay has been added to Mill B, which adds an additional 800 tonnes of storage capacity and has the capability of loading a truck in 10 minutes or less!